Colorado’s Great Sand Dunes National Park is at once intensely picturesque and fabulously fun place. Evolved over centuries by unique wind patterns on the San Luis Valley floor, eons of sifting and building, created epic dunes almost 800 feet tall and spanning for miles. Exploring this monolithic sandbox is like walking through an ocean of lofty dunes enveloped by some of the biggest Rocky Mountain Peaks. The park’s biology and geology create awe-inspiring and one-of-a-kind conditions rivaling more traditional parks. There are a large array of habitats to explore, from aspens and pines to sand dunes, shrub and grasslands, and even tundras and thick spruce-fir forests. The Great Sand Dunes National Park and Preserve are located in the easternmost part of the counties of Saguache and Alamosa. Originally designated Great Sand Dunes National Monument, the Park and Reserve were created by an act of the United States Congress on September 13, 2004. The park occupies approximately 149,005 acres. The park has the highest sand dunes in North America, that rise to a maximum height of 755 feet, from the floor of the San Luis Valley. This group of dunes covers about 19,000 acres and according to the researchers, began to form 440,000 years ago. The dunes are created by the sand and sediment deposits of the Rio Grande and its tributaries, that flow through the San Luis Valley. With the passing of the years, winds from the west collect the sand particles from the lands flooded by the river and when the wind loses its strength, before crossing the Sangre de Cristo Mountains, it deposits the sand at the eastern end of the valley. This process continues and the dunes grow slowly as the wind molds them again and again, each day. 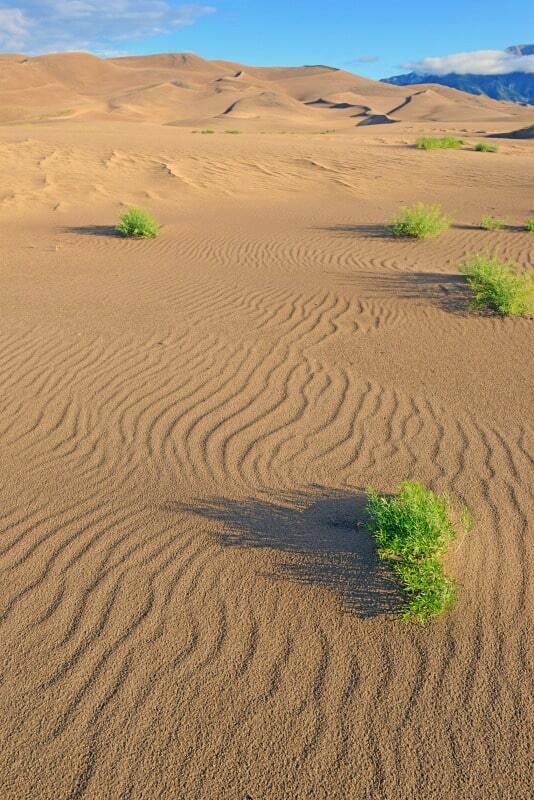 The dunes are pretty much stable but with the passing of season after season, their morphology changes a bit, their shape being affected by the wind intensity and direction. The wind normally goes from the SW to the NE but at the end of summer, the wind turns around creating the dunes. This is why the dunes are so high! The park also has mountain lakes and high mountain tundra, six peaks above 12,795 feet tall, old spruce and pine forests, meadows, and wetlands, etc. All these environments are home to various species of animals and plants. An extraordinary phenomenon can be observed on Medano Creek, a creek east of the dunes near the visitor center. Because fresh sand trickles evenly into the water, the stream does not find a stable and permanent river bed. This creates small underwater dunes that form dams and collapse again. To get to the dunes you have to cross the wide and very shallow Médano Creek, which runs only from spring until the beginning of summer. Hiking is permitted, with the announcement that the sand can be very hot in the summer, up to 60 degrees Celsius. The closest city is Alamosa although Cañon City, Pueblo, Colorado Springs, Albuquerque (New Mexico) and Denver are a few hours drive away. With so many available activities, anything from a day-trip to an extended vacation is possible in this sandy, a natural oasis.